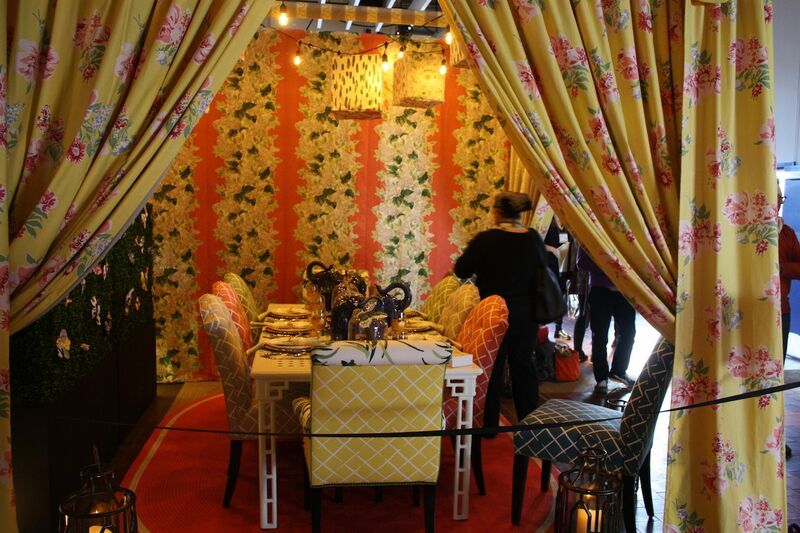 Some elegant, some fun or fantastical — and all inspirational: This spring’s DIFFA Dining by Design, presented imaginative and stunning table displays by a wide variety of designers. 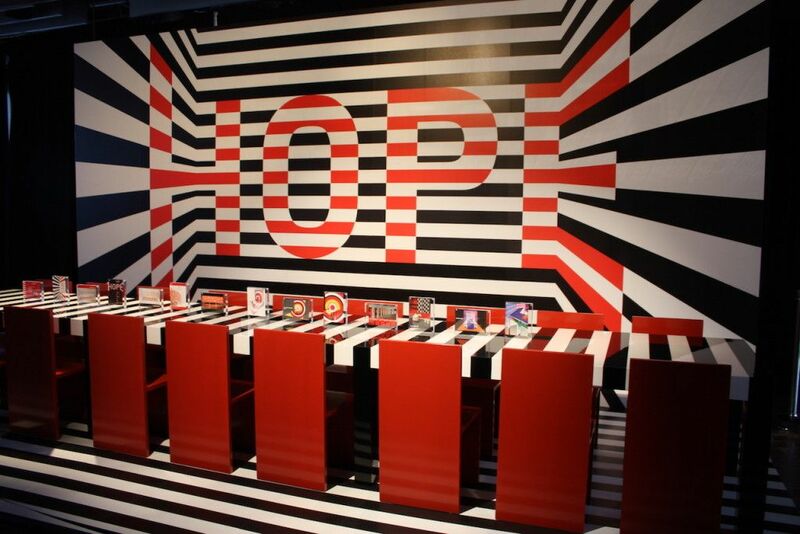 DIFFA: Design Industries Foundation Fighting AIDS is one of the country’s largest supporters of direct care for people living with HIV/AIDS and preventive education for those at risk. 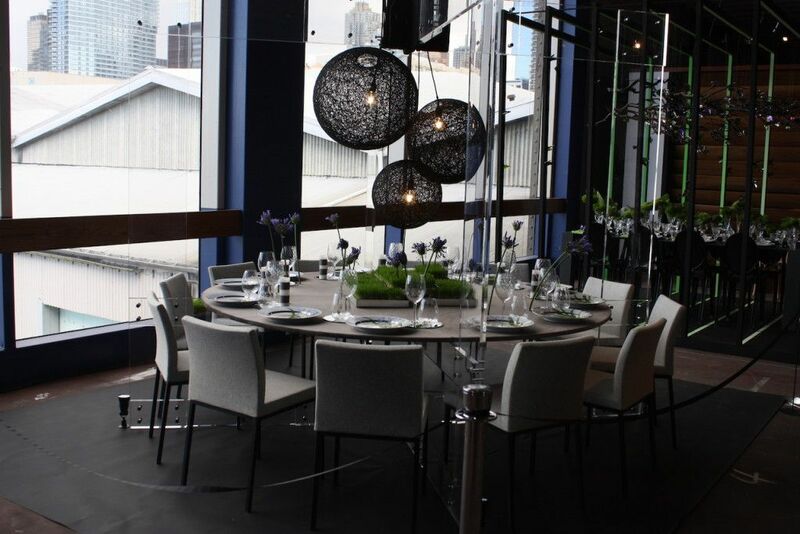 Running concurrently with the Architectural Digest Design Show in New York City, the event provided great ideas and inspiration for how you can dress up a dining table for your next dinner party. 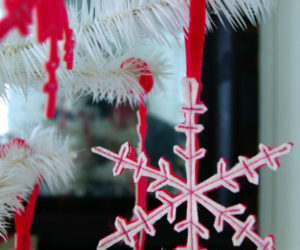 Students from Brooklyn’s Pratt Institute created this colorful and edgy setting. 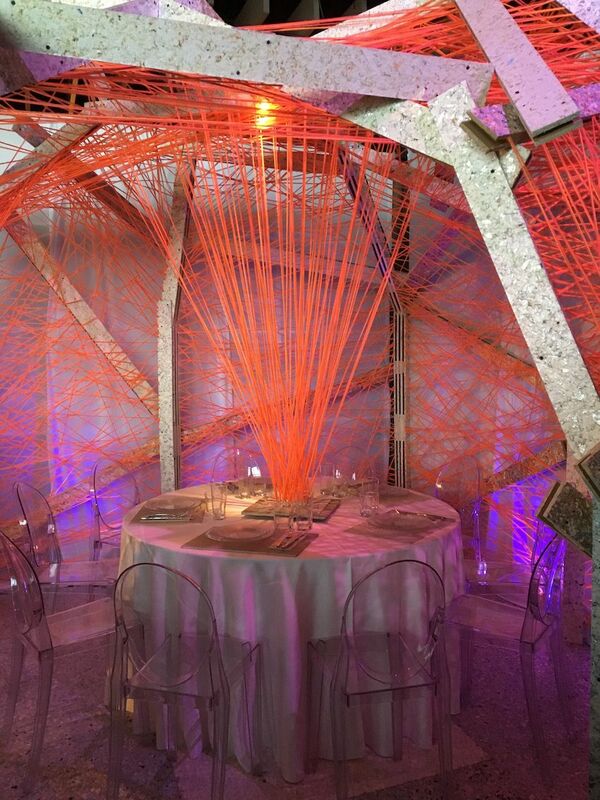 Bright orange strings seem to explode from the center of the table and surround the room. 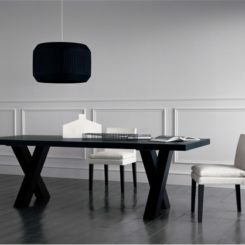 The unobtrusiveness of the lucite chairs help keep the focus on the strings. 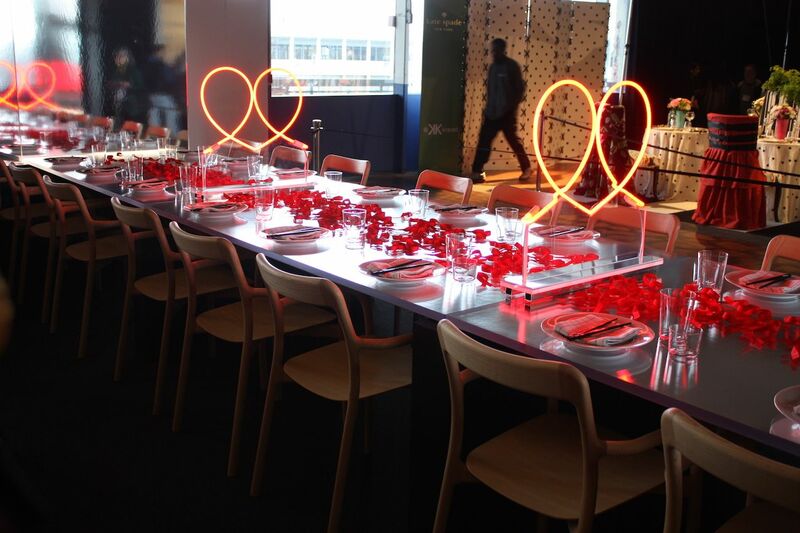 Plenty of red petals and neon renderings of the AIDS ribbon make a basic table and place settings more special. 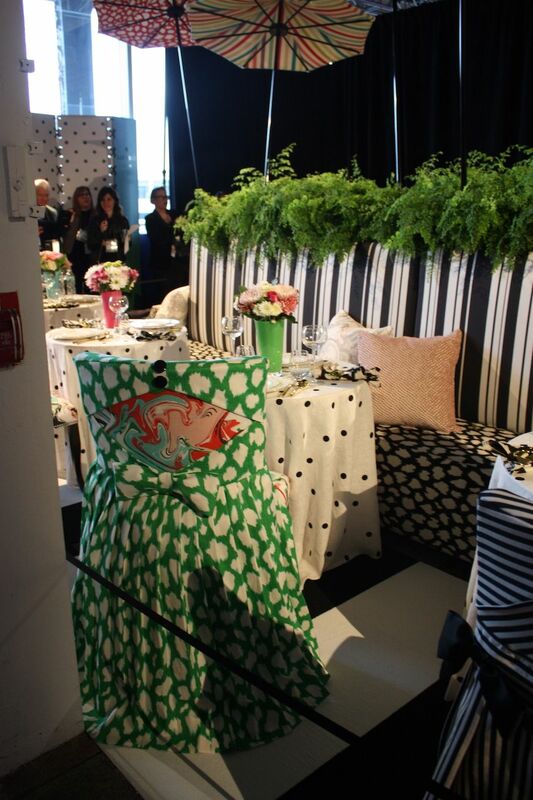 Kate Spade and Kravet collaborates on this colorful and playful setting. 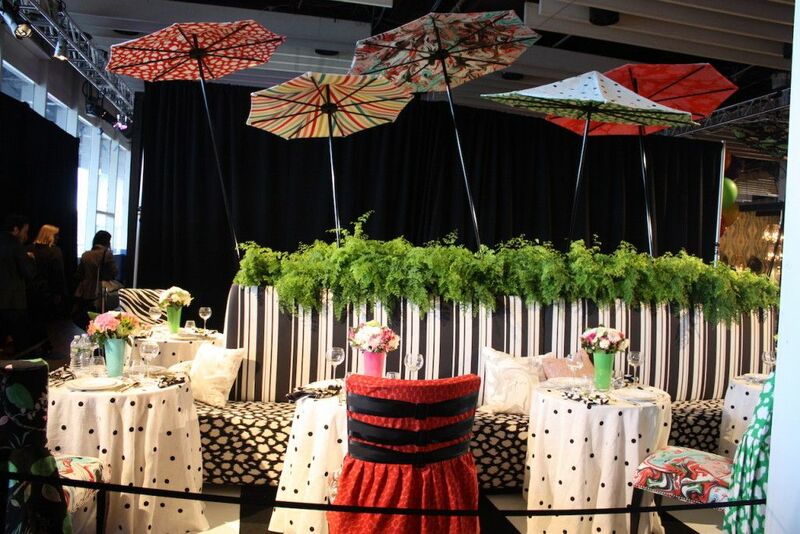 Colorful parasols and bright greenery against a backdrop of mixed black and white prints make for very lively decor. 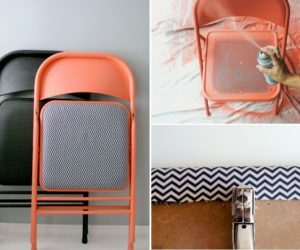 Colorful, unmatched slipcovers are a perfect counterpoint to the black and white background. 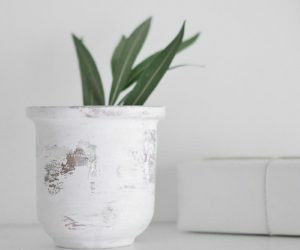 Simple vases with accessible flowers and delicate china complete the setting. 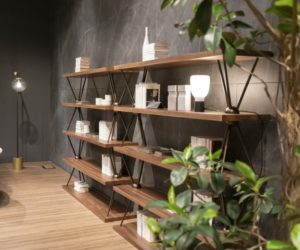 It’s a great example of how simple items combined artfully make a spectacular display. 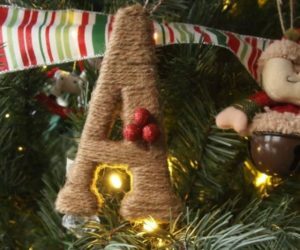 Simple string and paper in creative hands came together in a very dramatic fashion. 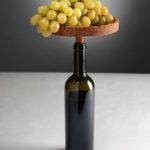 Thinking beyond flowers and fruit can be a budget-conscious and breathtaking option. 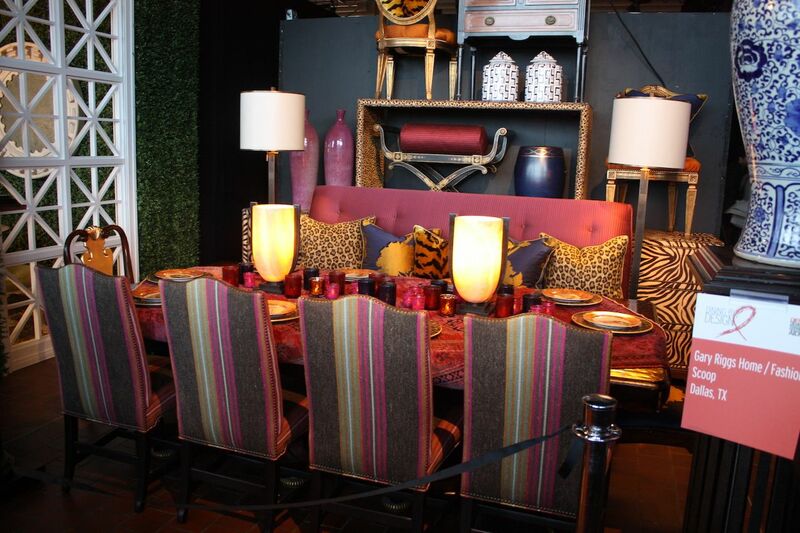 The global theme of this warm, inviting setting was created by Gary Riggs Home and Fashion Scoop. Using a middle eastern rug as a table covering is great alternative to the run-of-the-mill tablecloth and adds to the luxe feel. 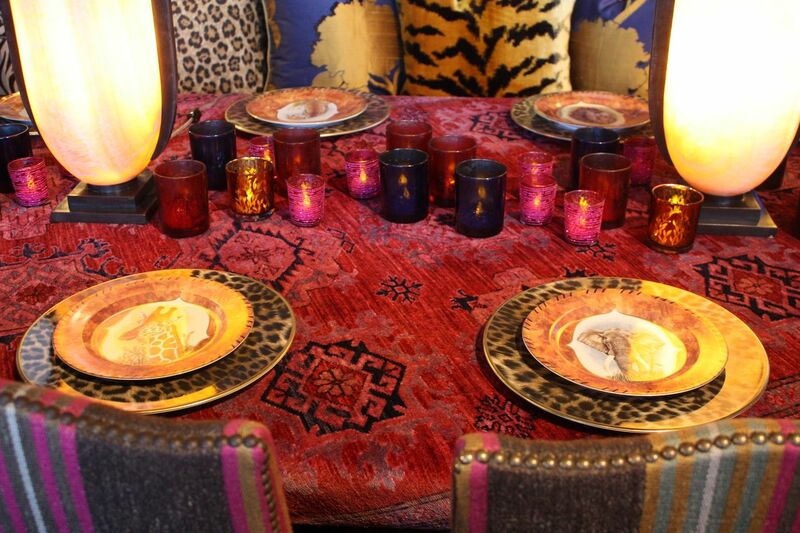 Animal print and gilded dinnerware adds to the exotic feel, while the collection of multicolored votives is a simple but effective firing its the taller lights. 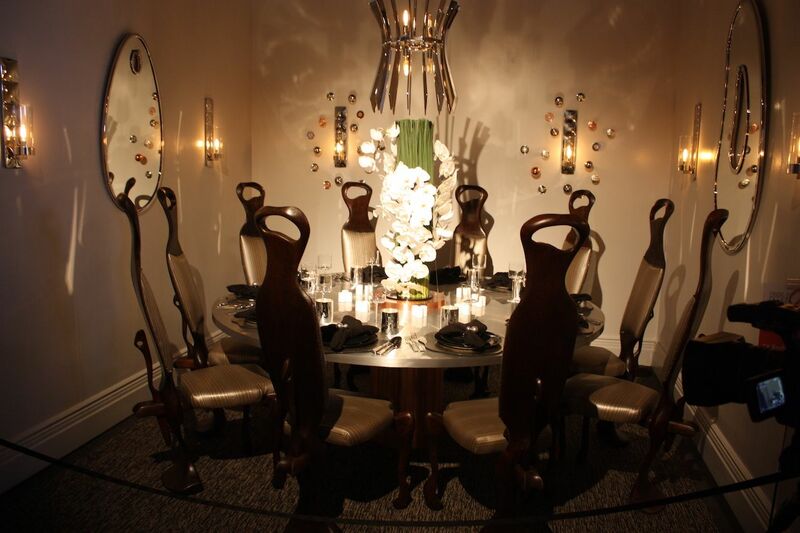 Moody, a bit dark, and definitely seductive, this table installation was created by Darren Varden and Lladro. The red upholstery and flowers are a dramatic contrast against the farm elements in the setting. 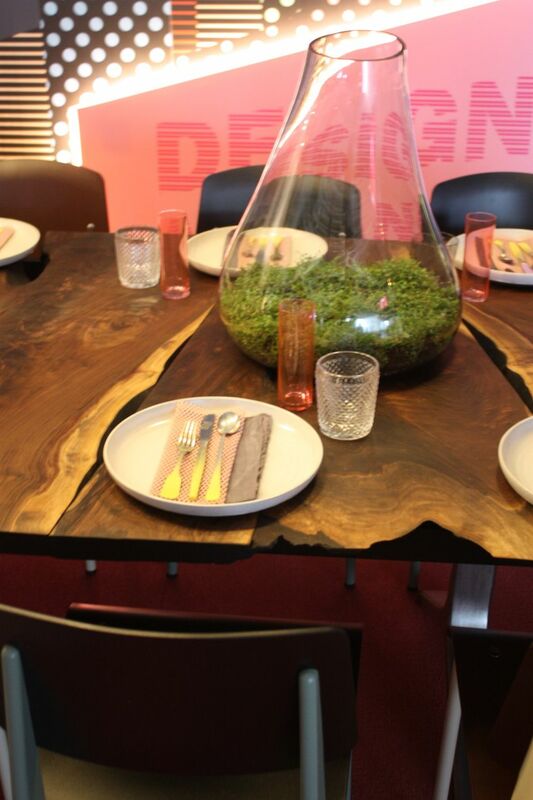 We’re nonthinking about doing a red table setting in our own dark wood dining room! 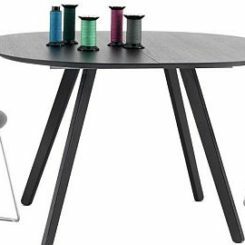 Knoll, the manufacturers of countless iconic furnishings, presented their dining area, which was an ideation of food, fun and friends. 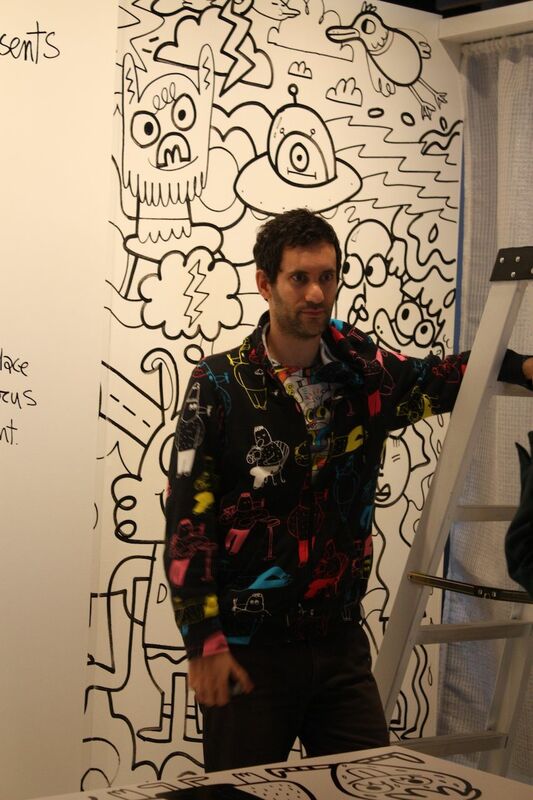 British-born artist Jon Burgerman created the art on site. 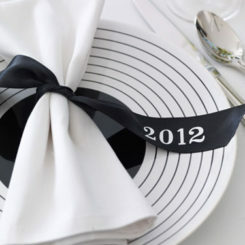 A simple black and white palette like this one would provide fodder for a full evening of dinner conversation. 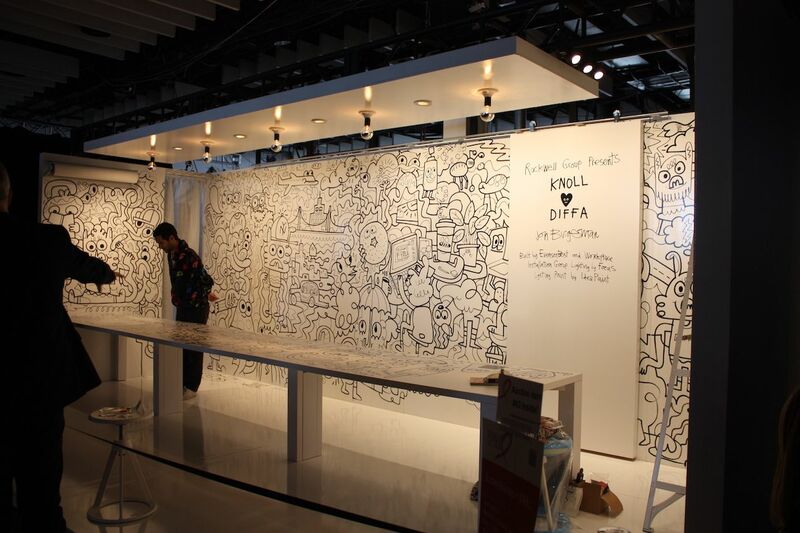 Bargeman uses doodles in his work and is often hailed as the leading figure in the popular ‘Doodle’ art style. 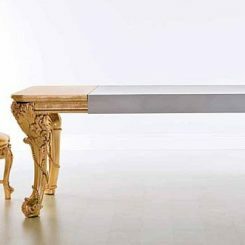 His work falls somewhere between fine art, urban art and pop-culture, using humor as a point of reference. 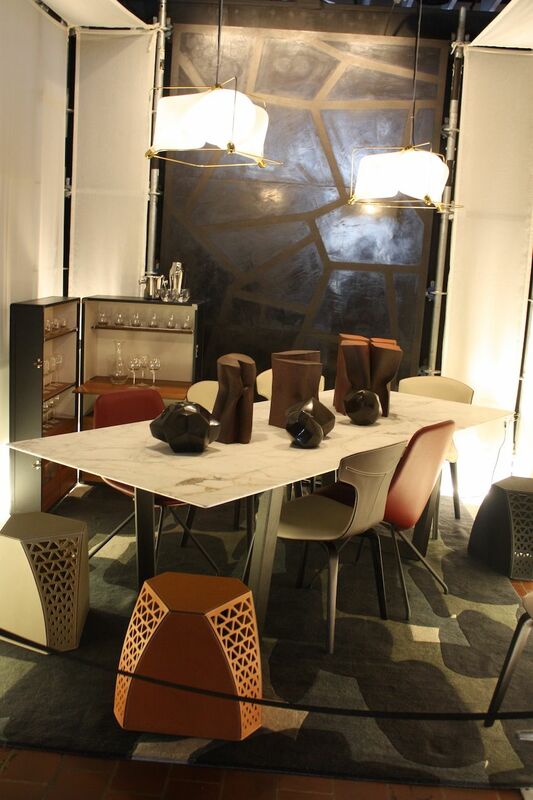 Leather stools are a fitting choice for this dining display by Poltrona Frau. 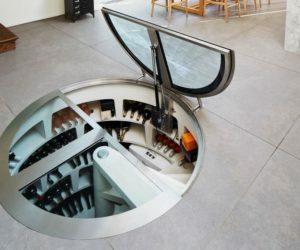 The marble-top table and a unexpected cocktail bar in a trunk come together for a sparse but elegant setting. 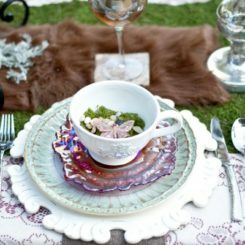 Madcap Cottage created this dining scene called “Into the Garden,” where you’d expect Alice the the rabbit to appear. 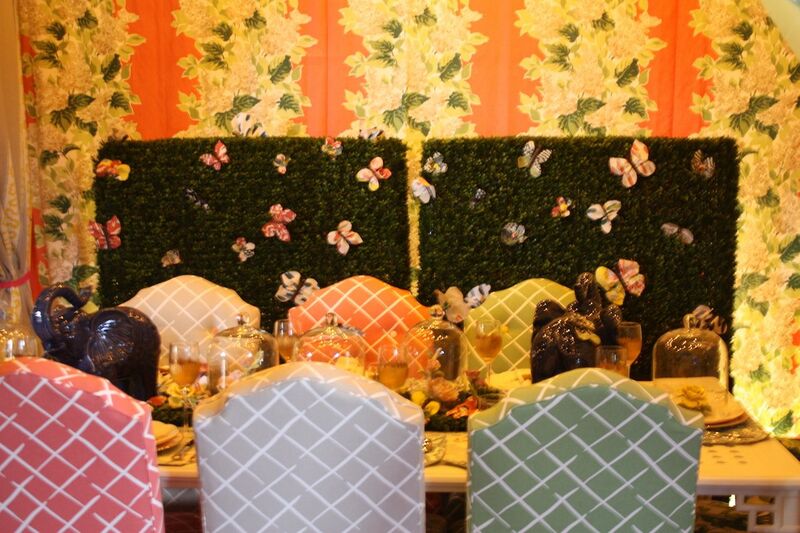 Floral wall paper, trellised upholstery and an entire kaleidoscope of butterflies make for a whimsical and cheerful setting. 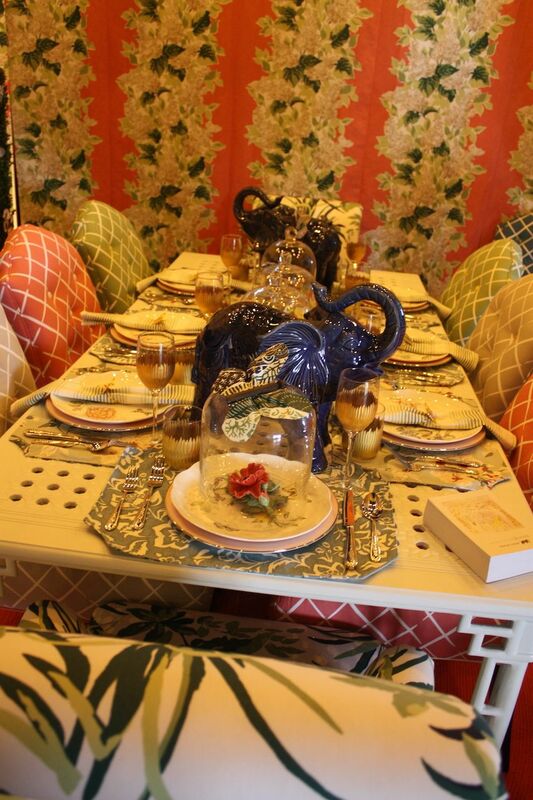 Fun accents like the cloche-covered bloom at the head of the table and ceramic elephants keep the style interesting. 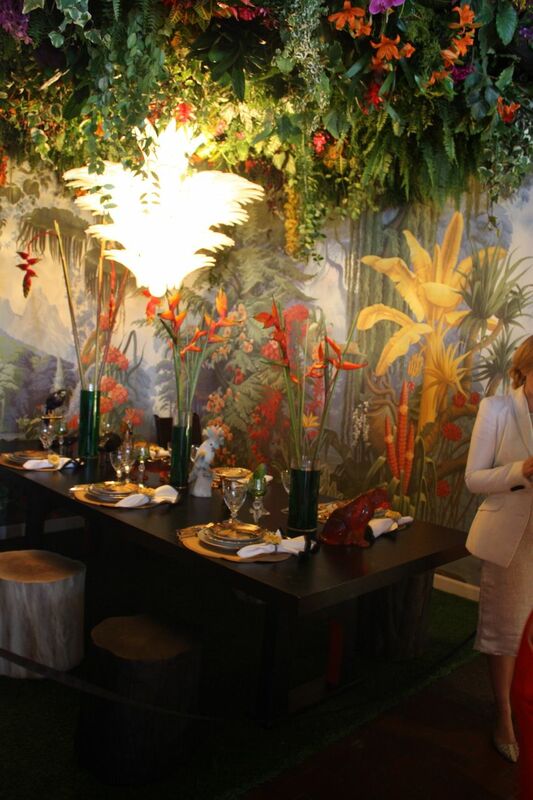 This lush rainforest, complete with a dense floral canopy above, was designed by Sasha Bikoff. The birds of paradise in spare black vases are perfect with the stunning tropical wallpaper. 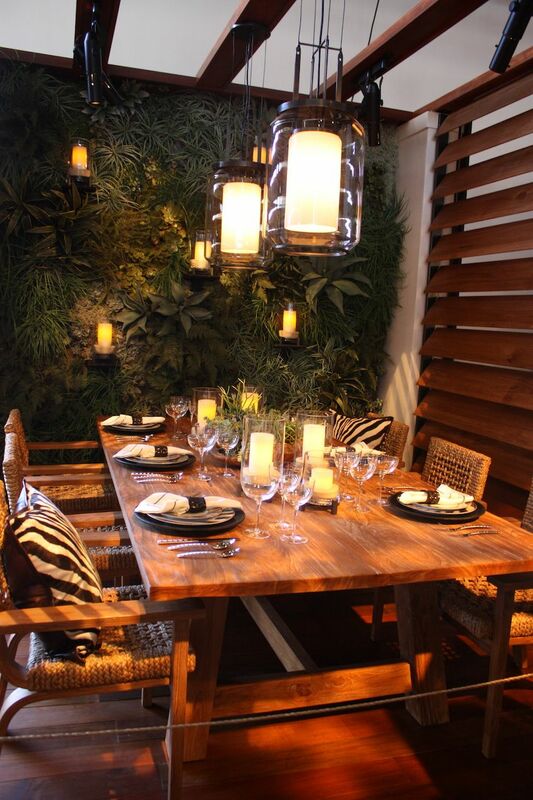 We particularly love the tree-trunk stools, which add to the woodland ambiance. 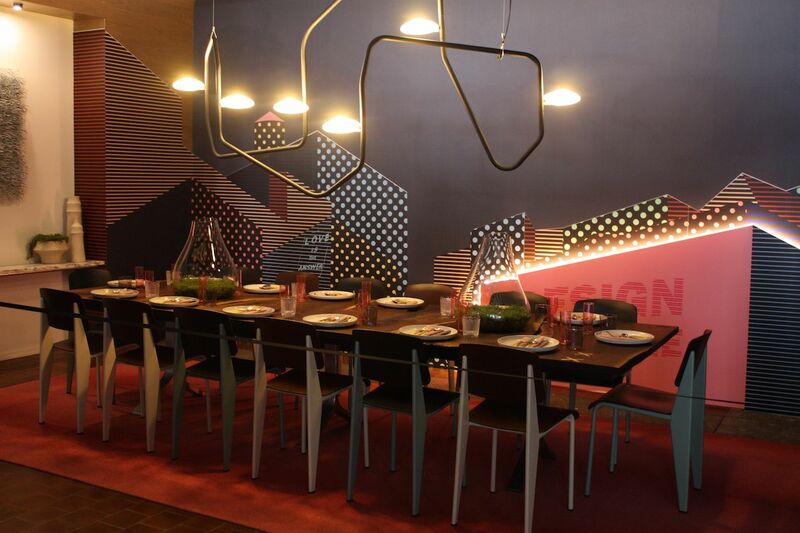 This dining space, dominated by crazy geometric triangles, was created by the New York School of Interior Design. 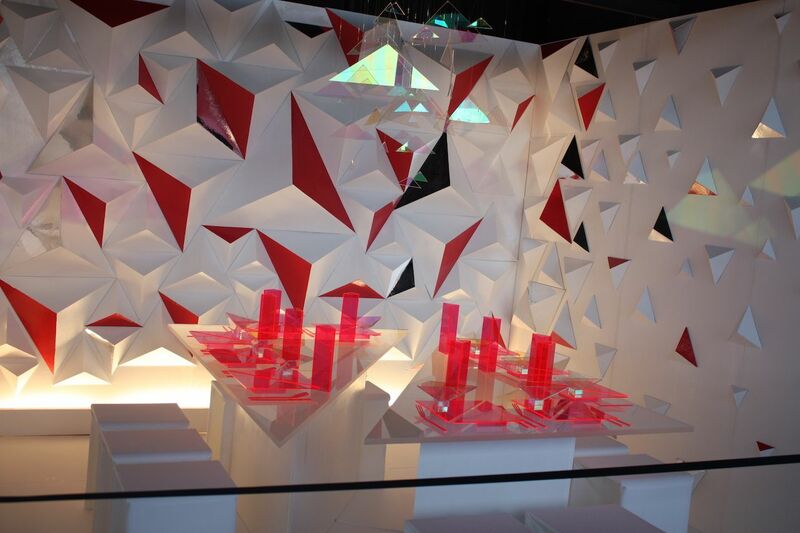 The contemporary theme continues to the table with bright lucite place settings, The triangle is representative of the three characteristics of a person living with HIV and AIDS: strength, courage, and perseverance. 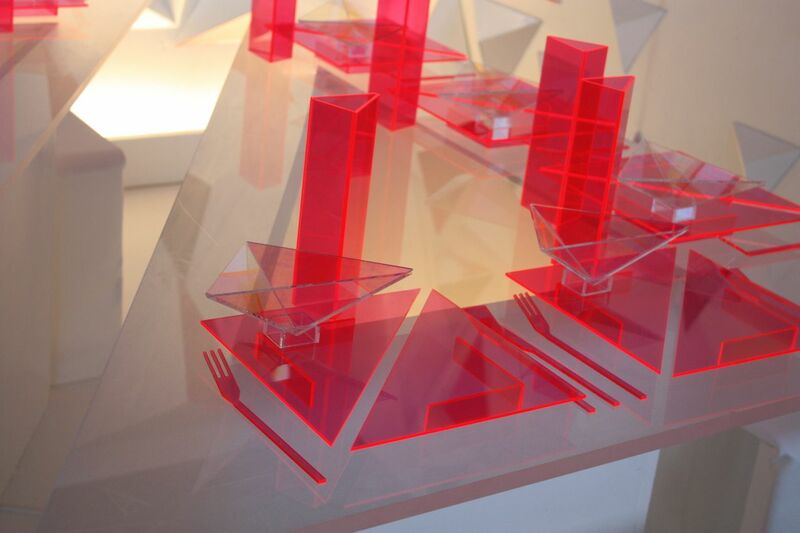 Colorful and futuristic, these lucite plates, cutlery and glasses are very fun. 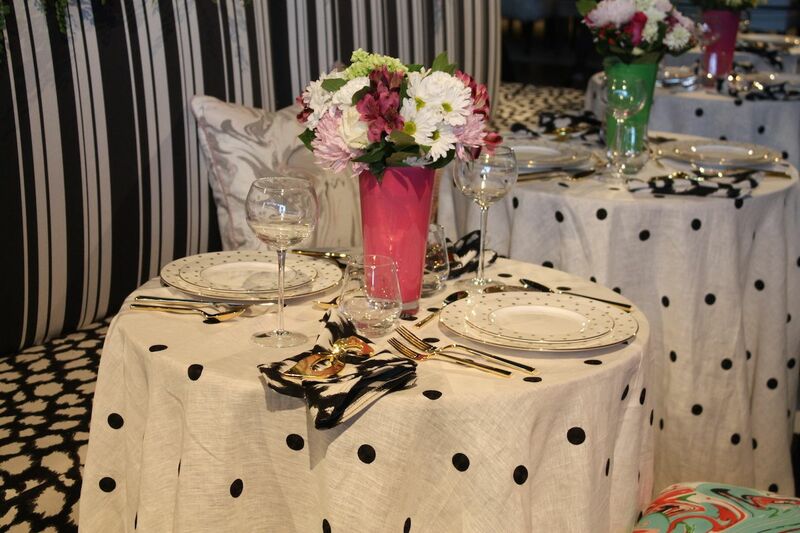 This gorgeous setting from Nourison has an undersea theme. 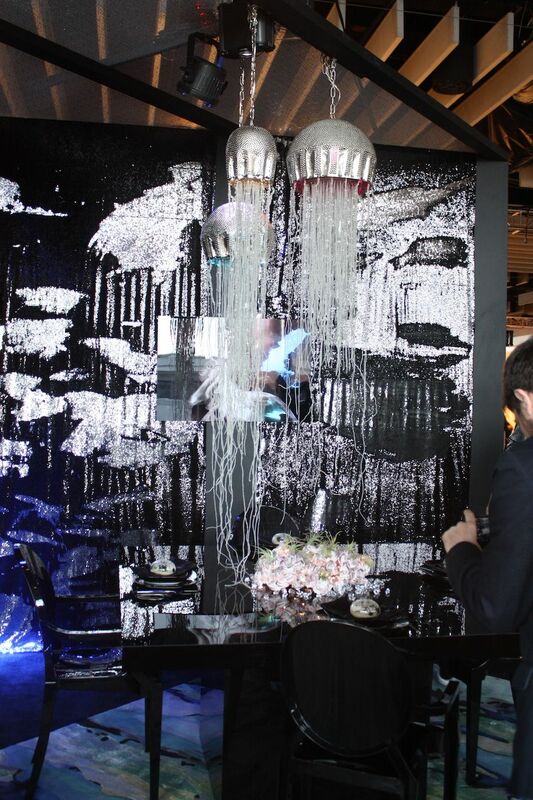 The designer created the jellyfish lights and the glowing centerpiece, fashioned from giant barnacles and LED lights. 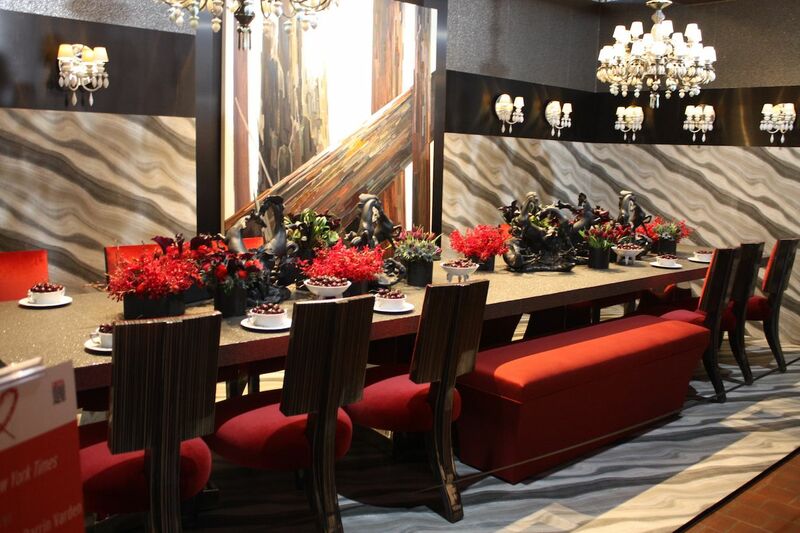 Shimmering fabric on the walls, full of sequins, an a dark dining table and chairs, complete the dramatic dinner scape. 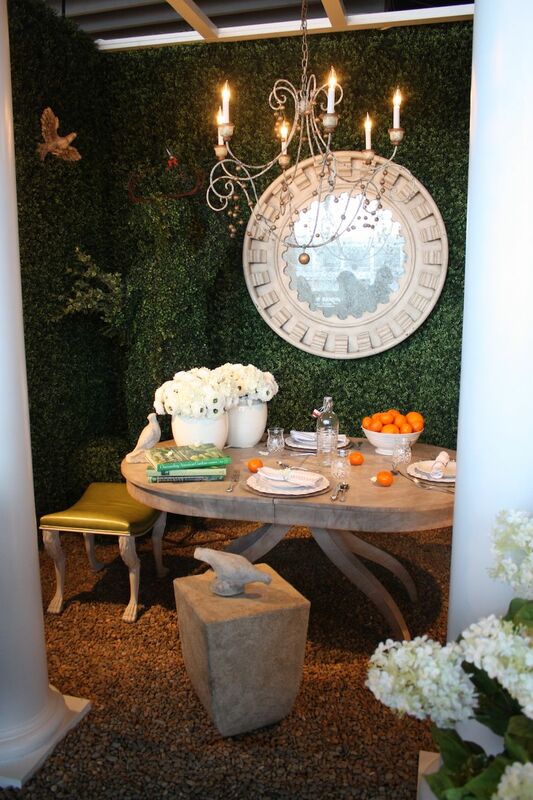 An intimate dinner for two would be perfect in this setting by New Growth Designs. 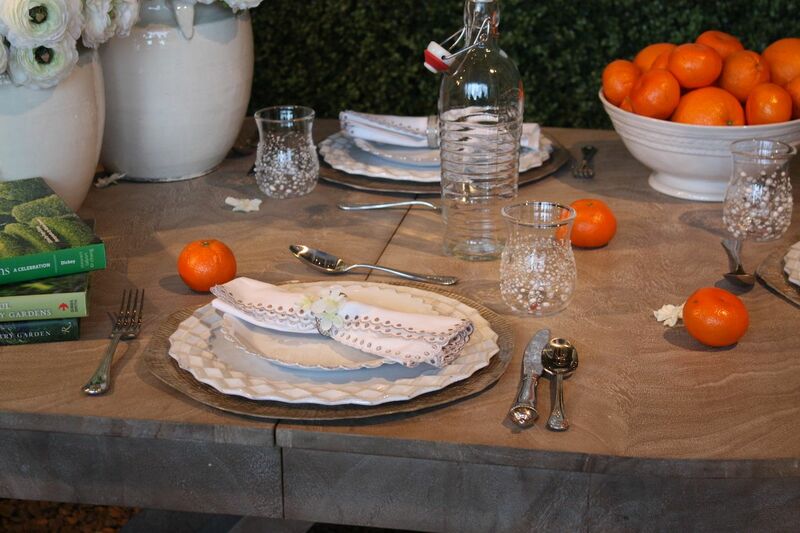 Hydrangeas and a bowl brimming with tangerines adorn the natural table. 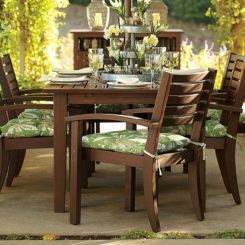 The peaceful and romantic outdoor setting was designed by Mary Douglas Drysdale. 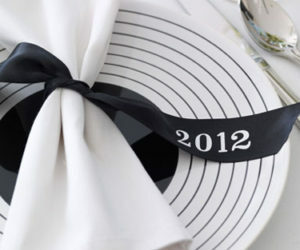 Simple and chic details like the lace edged napkin, vintage cutlery and casual drinking glasses make the setting special. 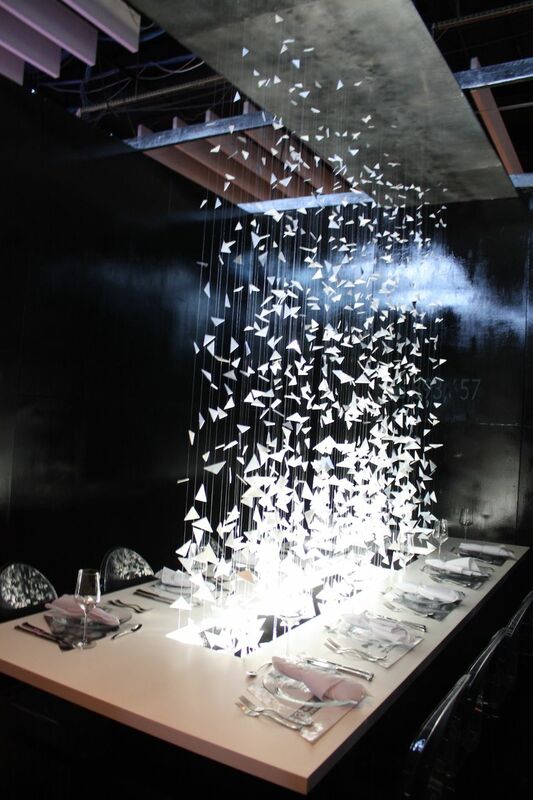 “Dining in the Sky” was designed by M Moser Associates. 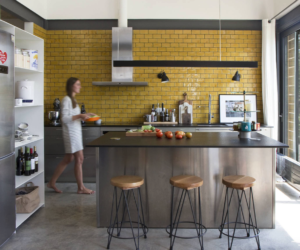 Industrial elements, neon colors and a neutral gray background are a fantastic blend. 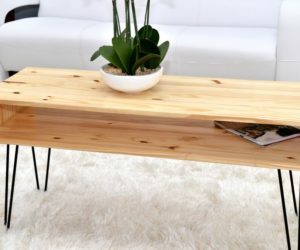 The matching chairs and long wood table add to the industrial feel. 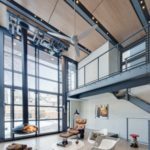 The edgy combination is softened by the live edge of the wood table and the organic feel of the terrariums that decorate the setting. 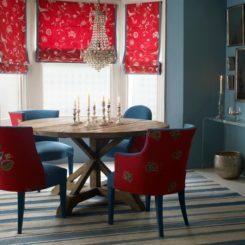 Created by the outdoor fair specialists, Sunbrella, this cerulean setting is lush thanks to the dramatic fabric-draped overhang. 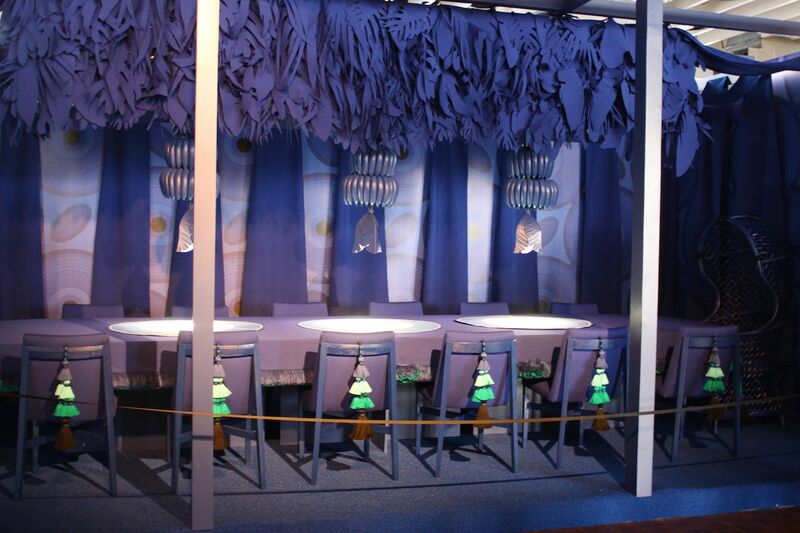 The tassels that accent the matching chairs are a dramatic touch,as are the chandeliers. 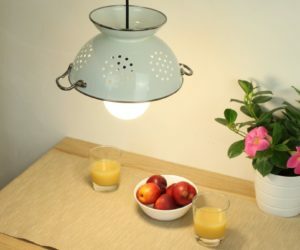 Created by Design Within Reach, this setting is very California. 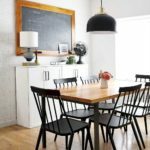 The bench seating, white accessories — and the jello molds on the table — create a cool yet casual vibe. 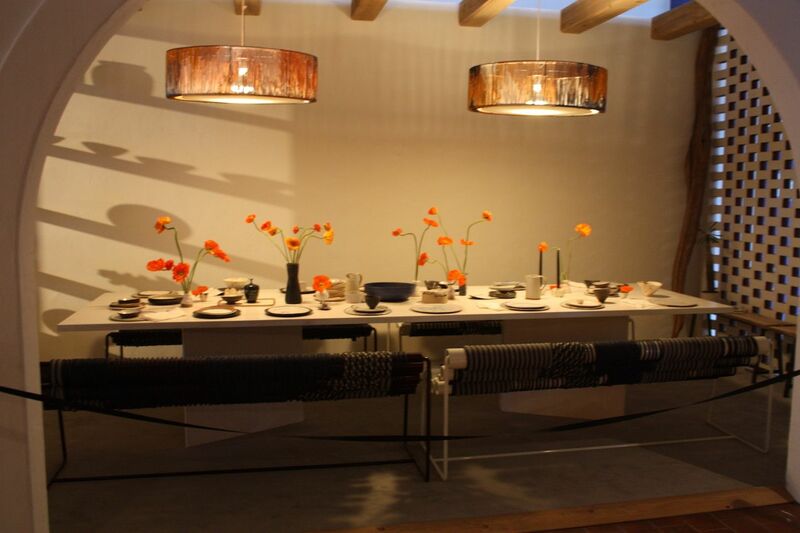 This temporary tablescape by Studio O+A & Teknion Studio is sleek and modern. 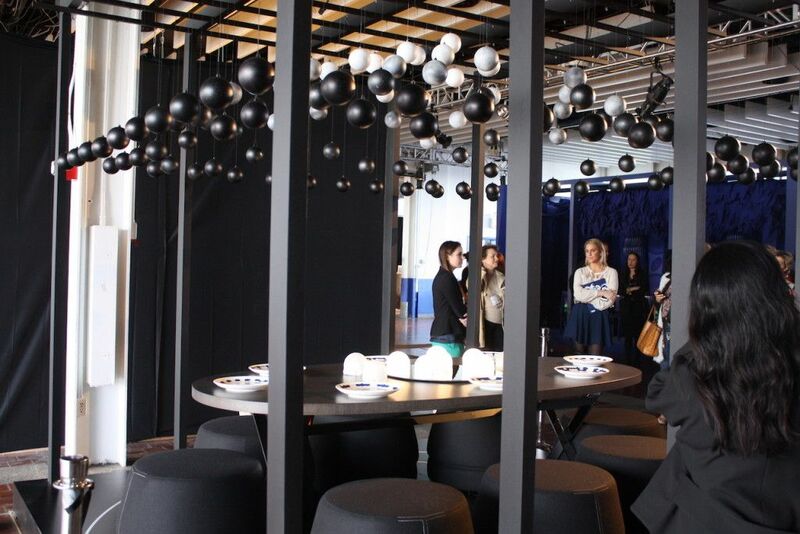 The cloud of black, grey and white balls above the minimally decorated table add interest as do the gray ottomans, which we really love. 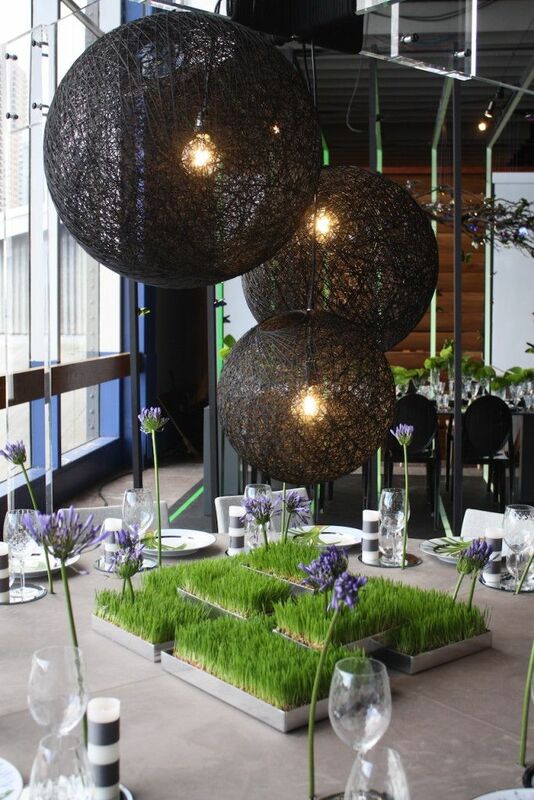 Mesh orbs hover over Marc Blackwell’s “This Life!” tablescape, which includes a live-grass centerpiece lily of the Nile. 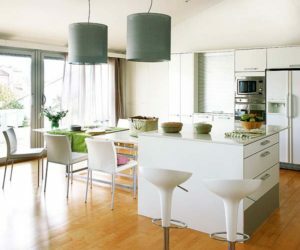 The greenery is a fitting counterpoint to the concrete table and neutral chairs. 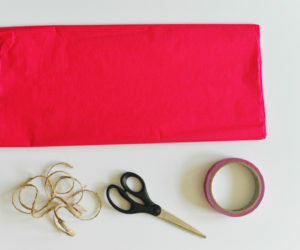 Cut flowers are gorgeous but can be costly. 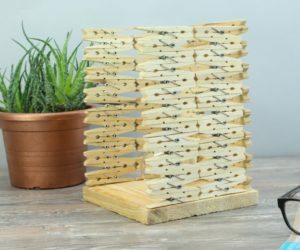 Sowing live grass in unique containers can be a style-forward and affordable way to create an interesting dinner party setting. 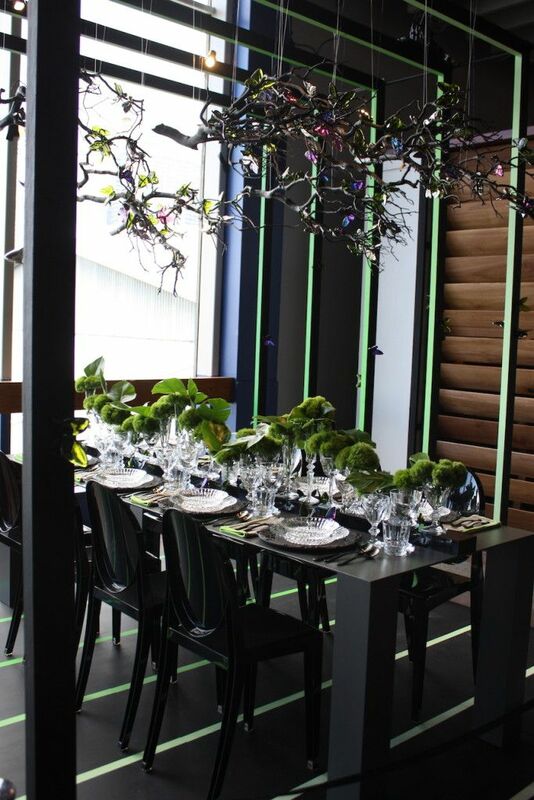 Baccarat crystal created this stunning dinner setting, with a mossy centerpiece running down the table and a chandelier of branches and multicolored lights. 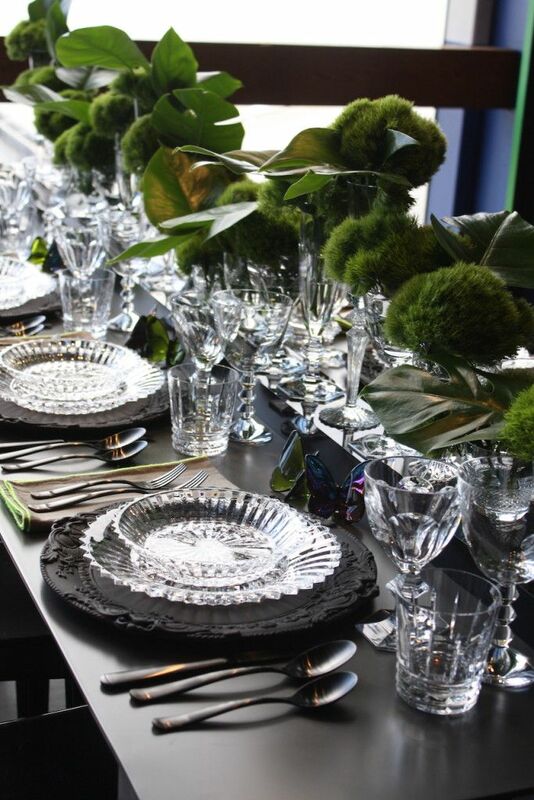 Fine crystal and natural greenery are a winning combination. 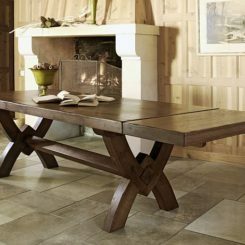 Echo designed a table that looks like it came from “out of Africa.” The natural rug, rusting table, canvas chairs, and safari-style lighting are stylish and dramatic. 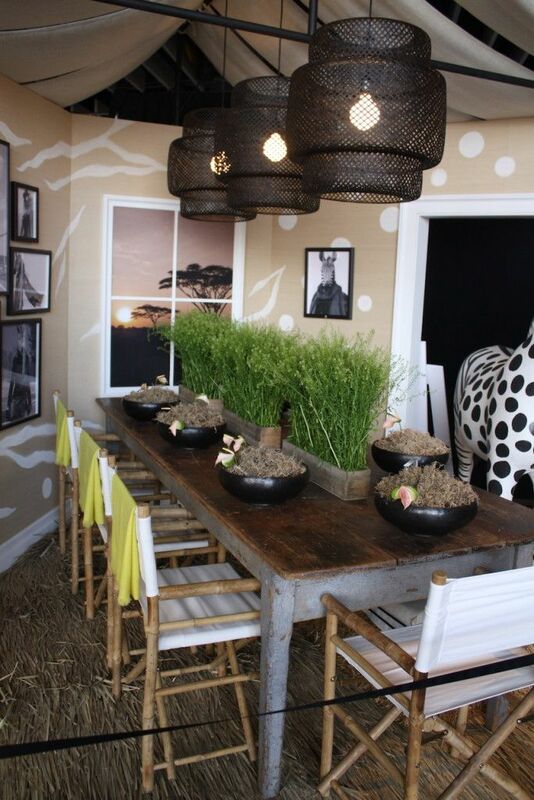 The whimsical zebra and natural centerpiece complete the adventurous look. 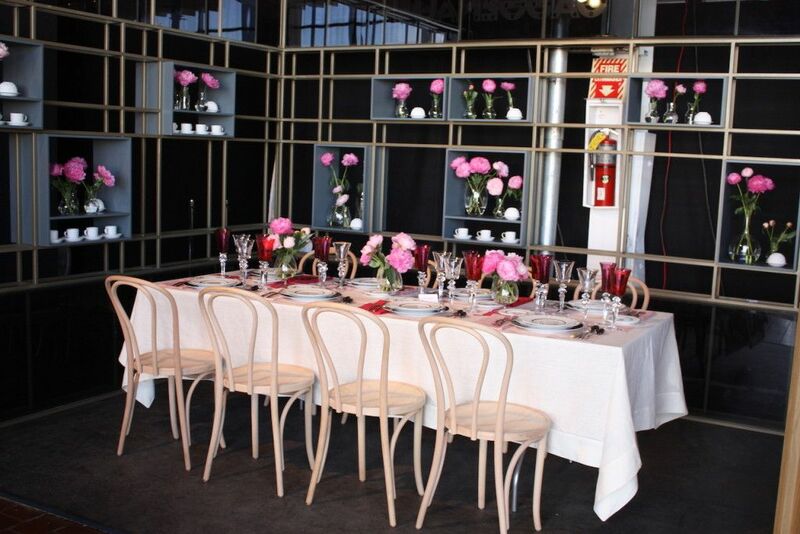 Designer Paris Forino used pink blooms to accent an otherwise sleek and spare setting. 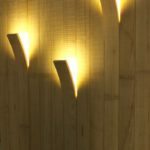 The cafe chairs also add a touch of softness to the angular setting. 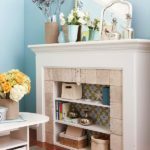 This Paris-style setting from Chicago designer Julia Buckingham for Benjamin Moore and Consentino is done in the color of the year, Simply White. 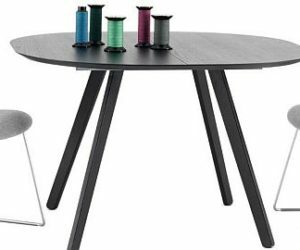 We love the mix of seating pieces that includes upholstered stools and a variety of armchairs. 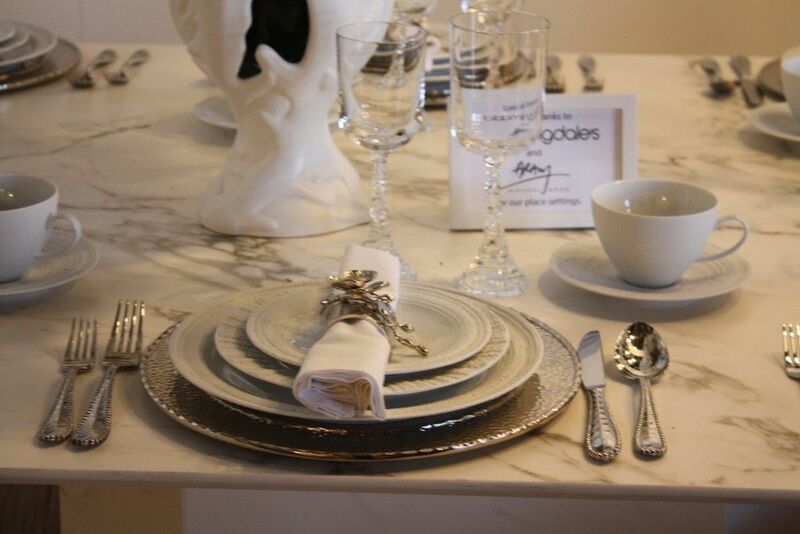 The place settings from Bloomingdales are elegant and formal. 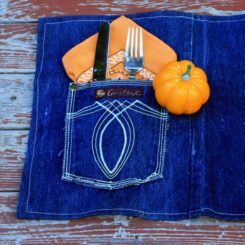 This tablescape by New York artist Betil Dagdelen, was inspired by Georgia O’Keeffe’s home in New Mexico and the desert. 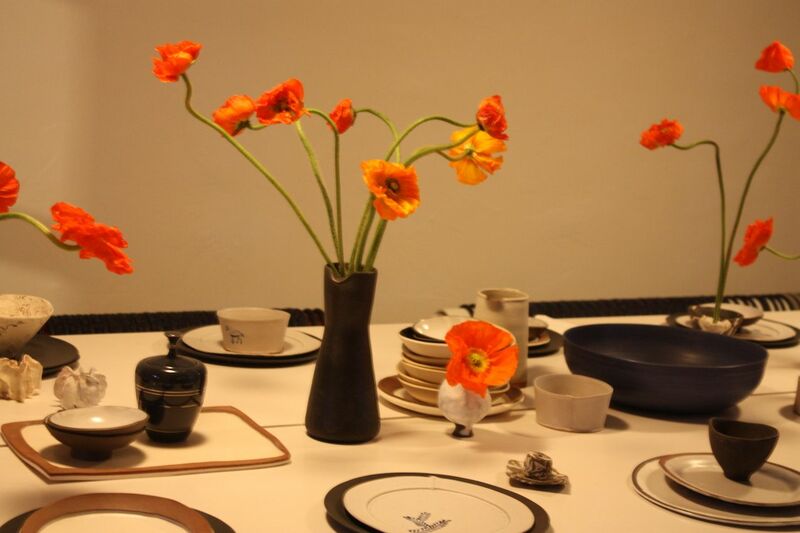 Spindly blooms in a mixed collection of vessels accent the simple table, set with neutral dinnerware. This stately setting by SA Baxter Design firm Ingram features a copper-and-aluminum table as well as the firm’s new lighting. 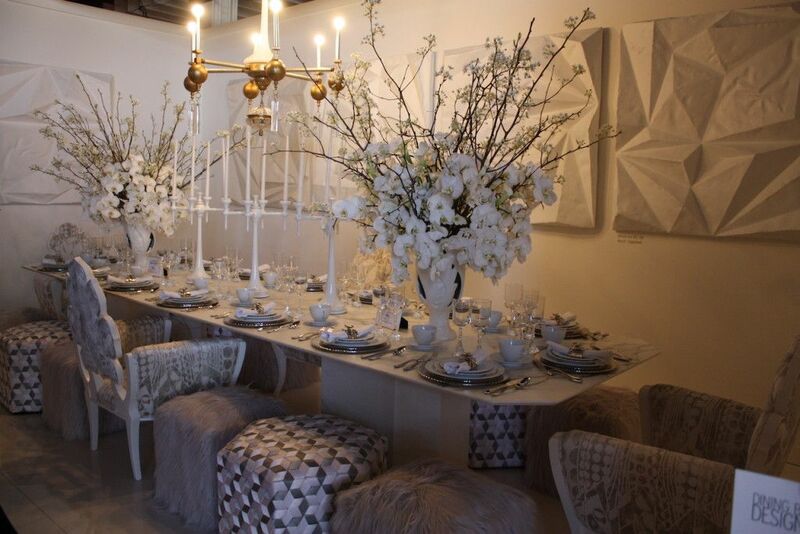 The orchid centerpiece and unusual chairs make for an elegant dinner tablescape. 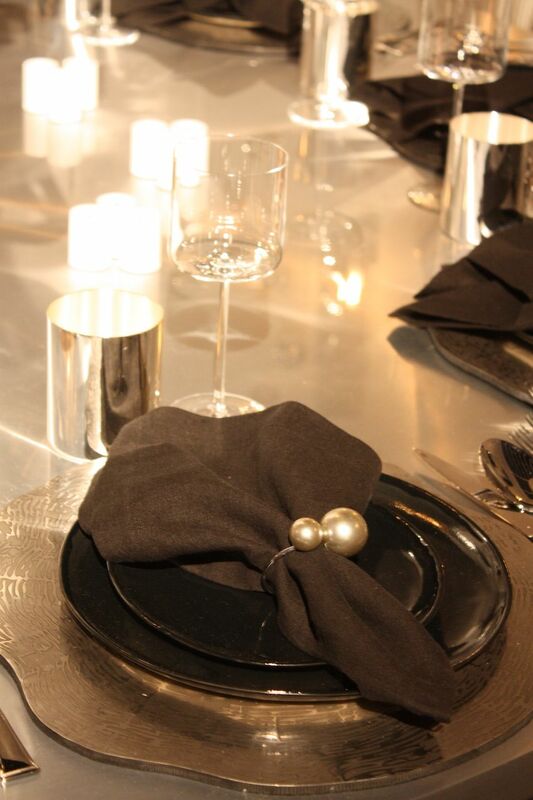 A unique charger and dark plates are accented by a minimal and elegant pearl napkin ring. 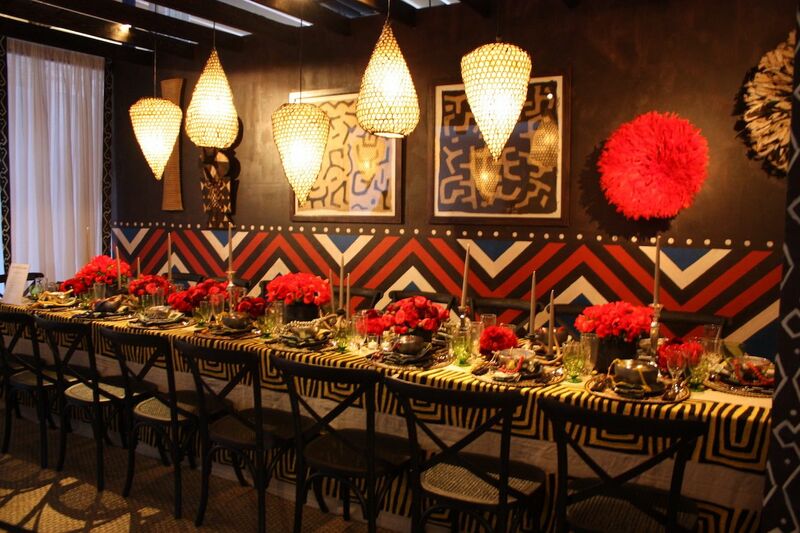 Africa was a popular theme among the tablescapes, which included this one by Architectural Digest Designer Bronson van Wyck. 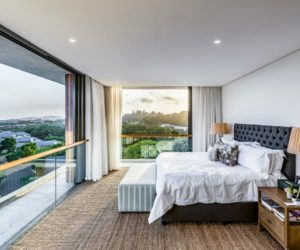 His creation includes a custom-printed backdrop, authentic artifacts, graphic linens and global-inspired pendant lighting. 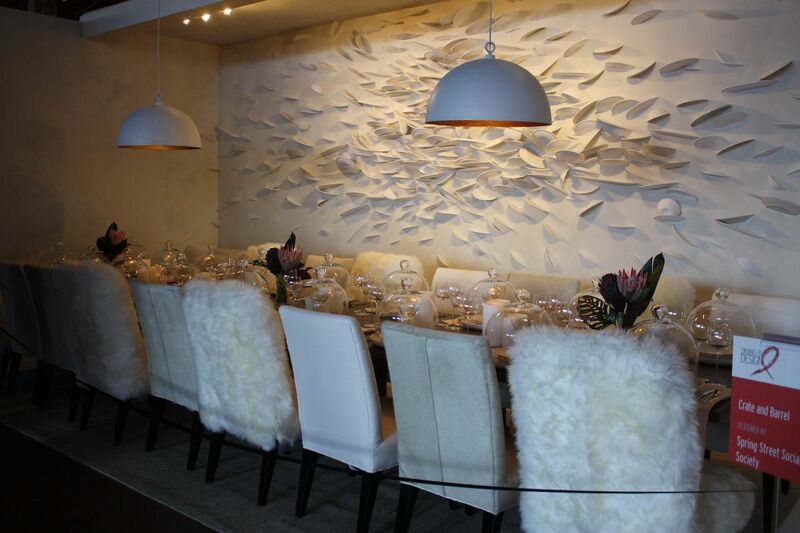 Crate and Barrel reinterpreted a fragmented-plates installation on the wall with a white tablescape. 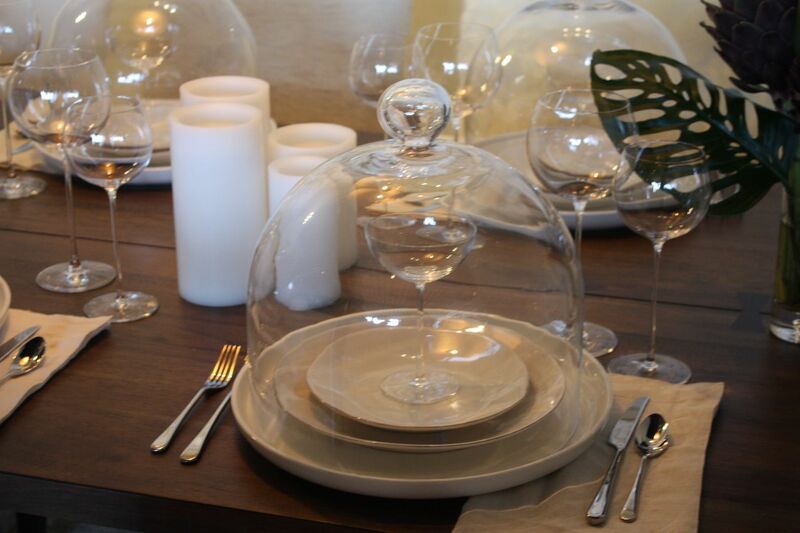 Each place has a glass cloche over a coupe. We particularly love the angora chairs and hair-on-hide seats. 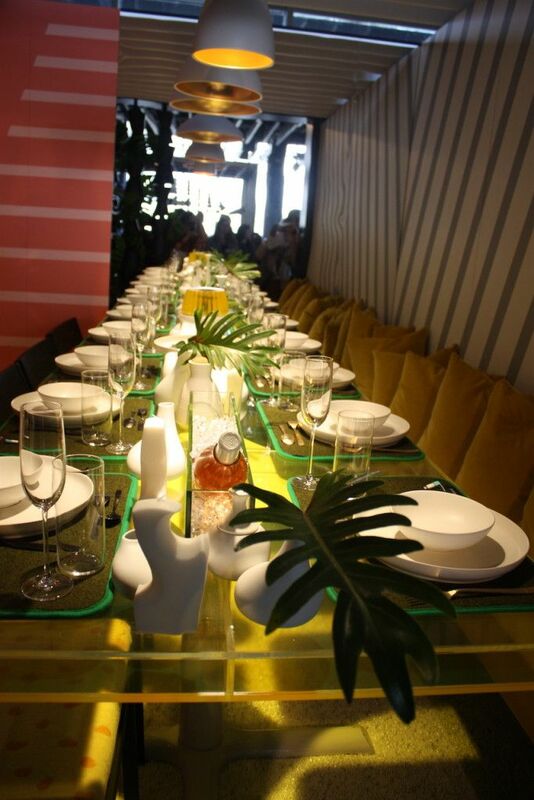 Antonino Buzzetta for the New York Design Center crated a colorful and fun rooftop party setting. 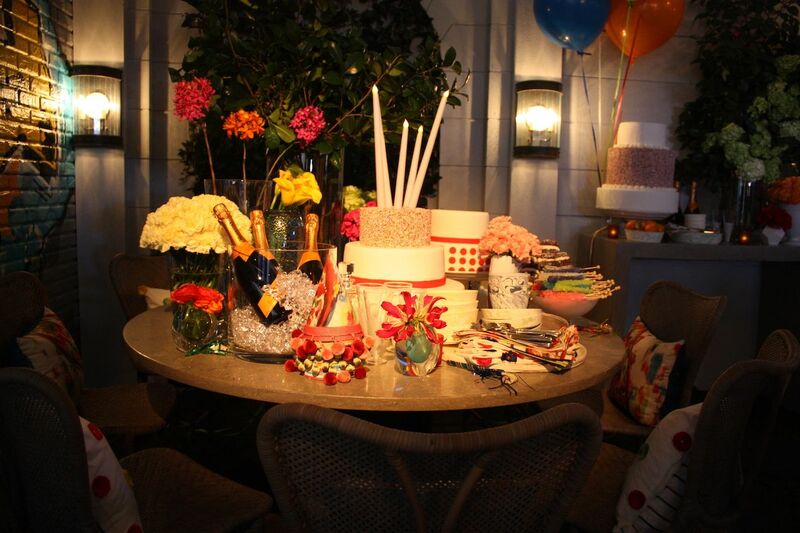 Rather than focus on formal place settings, the designer created displays of treats, cakes and drinks. It was all in celebration of the center’s both birthday.